In Bennett Miller‘s 2005 film Capote we are introduced to the real life titular figure, Truman Capote, as he begins his most famous novel, In Cold Blood. With great attention to detail, the film operates as a contrast of two Americas: one of stylish urbanity and the other of cold rural landscapes. In the former Capote appears invincible, in the latter he finds his psychological undoing. Almost a decade later, and after a sojourn into the decidedly sunnier confines of the baseball world, Miller has returned with his latest mesmerizing film, Foxcatcher. In it, he again uses a true-to-life subject to contrast two different versions of the United States. One is lived in by two wrestling brothers from humble beginnings; the other contains their erratic benefactor who appears trapped in a dynastic life that is far more airless. 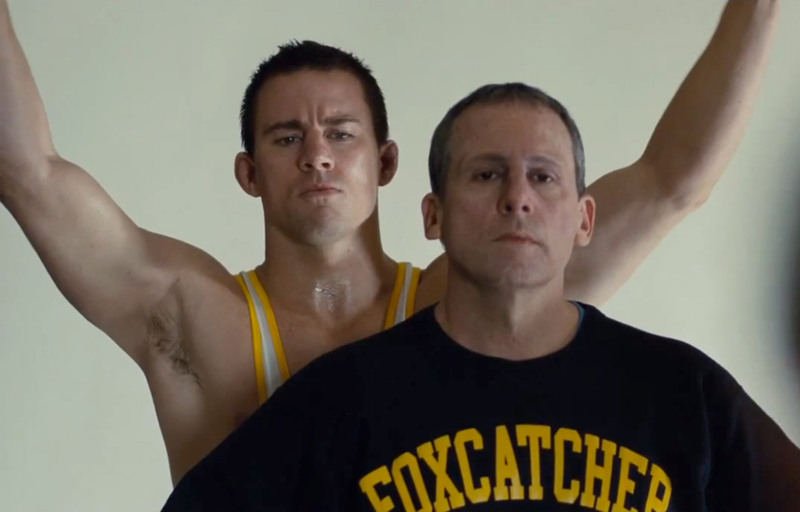 Channing Tatum as Mark Schultz. 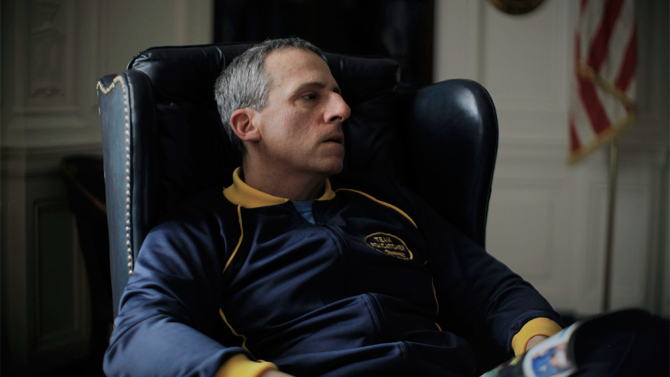 Steve Carell as John du Pont. Fun times. Foxcatcher‘s wrestlers, Mark and Dave Schultz (Channing Tatum and Mark Ruffalo, respectively), both won gold medals at the 1984 Los Angeles Olympics. Now it’s three years later and Dave has moved into a coaching role within Team USA’s Wrestling organization. Mark, meanwhile, still likes to wear his gold medal. The men train together in the same well-padded and harshly lit gyms, compete in the same echo-filled arenas, but Dave goes home to a wife (Sienna Miller) and kids while Mark eats fast food alone in his car. He stomps up the steps to a lonely apartment that exists more to house trophies than anything else. An early scene, before a speech to elementary school children, has Mark appearing chastened in the principal’s office. He’s rehearsing, but looks instead like an ape trying to fit in, an Incredible Hulk who constantly needs to explain himself. Faced with a changing and uncertain future, Mark does what anyone lost would do: he seeks comfort in the simple and familiar past. John du Pont (Steve Carell) is old America. He lives on a rich estate filled with enough totems, weaponry and regalia so as to resemble a museum rather than a livable space. The camera pans across these lands and you half expect a troop of Revolutionary War soldiers to come marching out of the woods. If Mark wanted historical comfort, the allure of du Pont’s red-white-and-blue patriotism would be hard to resist. He offers to take Mark under his wing as a coach and father figure, providing generous funding, training space and apparent freedom as part of his Team Foxcatcher wrestling program. It gives Mark, forever a little brother living in Dave’s shadow, a sense of purpose and belonging. We sense the danger immediately. A life such as du Pont’s, lived in opulent isolation, tends to curdle into eccentricity. He insists his friends call him Eagle (or Golden Eagle) and the line plays for a laugh; you know it was du Pont who nicknamed himself. Outside of a mother (Vanessa Redgrave) looming elsewhere on the property, does he even know anybody not on the payroll? Can he relate to anyone or anything he doesn’t already own? While Foxcatcher only obliquely explains its social dynamic, Miller loads the film with animal imagery to reinforce the confused relationship between Mark, du Pont, and later, Dave. The opening credits show the images of men on horseback with dogs. They’re fox hunting, one of the grand events of the old gentry. The activity is never directly referenced in the film but the effects of its animal imagery are set in motion. This is from a time before wrestling. When Mark is between rounds his brother-turned-coach Dave flaps a towel in his face, presumably to help cool and circulate the air. As I watched this mid-match technique play out multiple times, I couldn’t help but think of a matador gesturing to a bull. As a coach-athlete dynamic, the bull-matador relationship is not the ideal comparison to make. A coach seeks to train and inspire athletes – not harm them. Both Schultz brothers surely knew this, yet they fall under the sway of du Pont, who apparently does not. Early in the film, after Mark reveals the wrestling deal du Pont has offered him, Dave asks, “What’s in it for him?” The question snaps onto Foxcatcher like a well-applied choke hold and gradually pressures the film to its uncomfortable, and inevitably sad, endpoint. Like Capote, Miller has constructed an elegiac film of silences. There is music, largely of dulled horns, to provide a mournful tone, but it’s the quiet you remember: the scenes of empty fields, still gyms, and ornate rooms filled with suffocating history – and stuffed animals. Lost in these spaces is Tatum’s Mark. With his lower jaw jutting out, Tatum plays Mark as both hopeful and sad. He’s someone who wants to believe that he can be an American hero. Tatum looks like an action figure, but his face betrays this stunted introspection. His brother Dave, as played by Ruffalo, is the realist. As a wrestling coach and family man, he is invested in the fates of both USA wrestling and his brother. With a receding hair line and woolly beard, Ruffalo embodies Dave’s nice guy “mentor” persona. In the film, Dave alludes to the brothers’ fractious family, a youth spent moving around. The Schultz boys do not come from a place of permanence, they’ve never had a residence with a formal name – just each other. The familial relationship forms the positive core of the film. A core that is undone by du Pont’s lecherous presence. Steve Carell as du Pont. Pondering. Du Pont clearly sees himself as a leader, the eagle, soaring over the creatures below. He wants to believe he can inspire them. The casting of Steve Carell, everybody’s favourite virgin and office buffoon, feels strange at first. Carell plays du Pont as if he is constantly posing for a portrait. Every time he steps into the frame, it painfully warps towards him. Then you realize why it works: this is Michael Scott turned to 11. He desires more than anything else to be loved and respected. Carell’s unique talent of gleefully twisting an audience’s nerves is put on fine display. Will his du Pont do something rash? Say something uncomfortable? In The Office, the worst that could happen was embarrassment. What is Michael Scott unfettered by even the most basic demands of normal life? Erratic, unknowable and vaguely dangerous; in other words, a fox. As a representation of the repressed “old world” America, there is Redgrave and the horses. As du Pont’s mother, Redgrave represents all that he wants to shuck off. Her withering stare feels more powerful than a body slam. Instead of embracing the horses as his familial destiny, du Pont lunges for a different kind of thoroughbred. He seeks that kind of companionship and uncomplicated love. But also, he desires the value earned only through competition and winning. At one point du Pont commands Mark to “stay” and you can hear it in his voice. It’s the same sense of entitlement that later has him angrily call Mark an ungrateful ape. For all the elaborate nomenclature, the beautiful scenery and historical import, a foxcatcher is still just a fancy word for dog.